NEW YORK, Feb 26 2014 (IPS) - A nurse helps an old man up from his chair. Holding onto her arms, he steps blindly forward, trusting her to lead him to his spot at the lunch table. One man breathes through a respirator. Another gropes on the nightstand for his dentures. Yet another calls out to a passing doctor that he cannot remember his own name. This may sound like a typical day at a home for the elderly but several independent investigations describe such scenes being played out in a much more unlikely place: in prisons across the United States that are now home to thousands of senior citizens. Due to unhealthy conditions prior to and during prison terms, the National Institute of Corrections (NIC) considers inmates over the age of 50 to be “aging”. By this calculation, there are some 246,600 elderly inmates in state and federal joints, a number that is expected to jump to nearly 400,000 by the year 2030, according to the American Civil Liberties Union (ACLU). A Human Rights Watch report entitled ‘Old Behind Bars’ says the number of prisoners aged 55 and older nearly quadrupled between 1995 and 2010, marking a 218 percent increase in just 15 years. 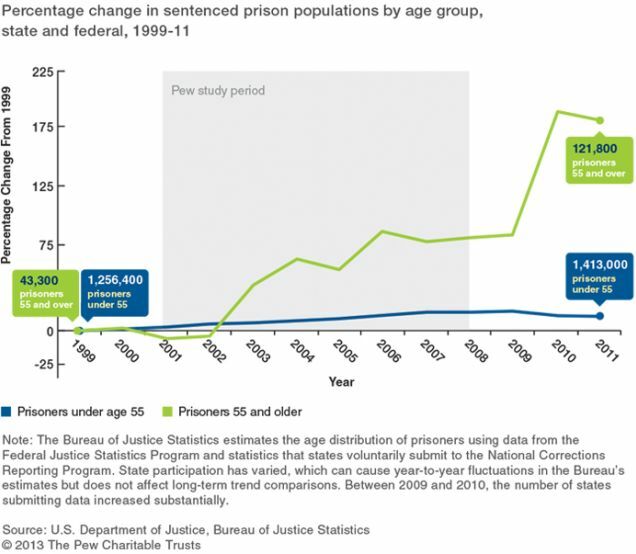 With over 16 percent of the national prison population falling into the “aging” category, experts say the U.S. prison system is beginning to resemble a gigantic geriatrics ward, at massive economic and humanitarian costs to society. Jamie Fellner, senior advisor of the U.S. Programme at Human Rights Watch, told IPS that “tough on crime” laws of the 1980s and 1990s resulted in a surge of decades-long sentences for crimes that hitherto carried no more than 10 to 15 years of jail time. “When you have people serving life sentences, they’re going to die in prison, just like people serving 20-, 30- and 40-year sentences are inevitably going to grow old behind bars,” Fellner said. 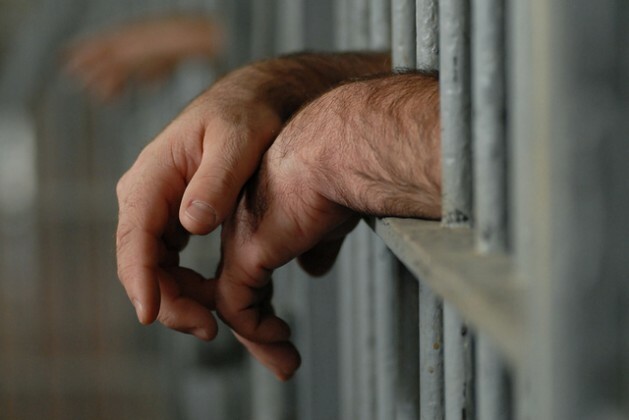 Other sources, including a recent report by the Pew Center Charitable Trust, suggest that 1970s-era federal laws such as mandatory minimum provisions, “three-strikes-and-you’re-out” legislation, and heavy parole restrictions have also contributed to the spike in graying inmates. Whatever the reasons, experts are agreed that the cost of imprisoning anyone over the age of 50 is astronomical. An ACLU report entitled ‘At America’s Expense’ found that, while it cost just 34,135 dollars a year to house the average prisoner, elderly inmates incurred almost double the expenses, reaching 69,000 dollars per prisoner annually. Taxpayers shell out over 16 billion dollars every year to keep aging prisoners behind bars, an amount that exceeds the annual budget of the Department of Energy and even surpasses the Department of Education’s spending on improving elementary and secondary schools. Such stark figures have pushed advocates to ask two fundamental questions that prison officials and the Justice Department seem reluctant to address: What is the purpose of incarcerating the elderly, and is there an alternative? According to Laura Whitehorn, a political activist who spent 14 years in prison and now works on a New York-based campaign known as Release Aging People in Prison (RAPP), the extremely low recidivism rate for people over the age of 50 makes a strong case for expediting their release. For instance, just seven percent of New York state prisoners released at ages 50-64 reoffended, a number that fell to just four percent for inmates over the age of 65. In comparison, the recidivism rate for all age groups hovers at close to 40 percent. Furthermore, prisoners who have served considerable time could be huge assets to their communities, Whitehorn told IPS. “The reason the prison advocacy movement is so vibrant now is because most organisations have several to many formerly incarcerated people on their staffs, providing keen ideas for what has to change in order to get us out of the current pit of perpetual punishment and the damage caused by the prison system. “This is how we came up with the slogan ‘If the Risk is Low, Let Them Go’,” Whitehorn said, adding that, too often, parole boards look at the original sentence rather than a prisoner’s likelihood of reoffending when considering early release. She recounted the recent case of an 86-year-old man who has served 40 years of a life sentence for a felony committed in the 1970s. Although he suffers from asthma, cancer and a neuromuscular disorder that confines him to a wheelchair, his parole board denied him release last year on the grounds that he was “likely” to reoffend. Fellner told IPS that she interviewed a prisoner in Mississippi who was so old he had to stick the letters L and R on his shoes to remind him which went on the correct foot. “Do we really consider these people a threat to society?” she asked. Fellner says the architecture of prisons was developed for the prototypical “tough young criminal”, resulting in institutions that are not easily navigable by infirm or disabled inmates. This inability is sometimes perceived as an unwillingness to cooperate with guards, earning elderly inmates punishments or longer sentences. A senior citizen at a Pennsylvania state penitentiary told IPS under condition of anonymity that he was forced to spend a week in solitary confinement for refusing to pass through the metal detector without his cane. Officials at various institutions across the country are now questioning the necessity of keeping geriatrics locked up. Even Burl Cain, the warden at Louisiana State Penitentiary of Angola, recently told the ACLU it was a “shame” that his staff buried more inmates than they released out the front gates. Of Louisiana’s 5,300 prisoners, 4,000 are serving life without parole, while 1,200 are over the age of 60. Still, the decision to release elderly inmates is not up to prison officials alone. According to Fellner, the U.S. incarceration system is governed by a highly punitive philosophy that, coupled with strong lobbying by organisations representing the families of victims, makes it tough to effect substantial changes. “Personal, professional and institutional party politics all make it very difficult to take steps on behalf of someone who has committed a crime,” she said. The school to prison to Medicare-funded nursing home pipeline. It’s like the nightmare version of socialism.